Fortunately Open Media Vault, OMV, emails warnings when disks are failing. This is also true for the system disk. I have been getting warnings my old system disk is failing and this is what I did to fix it. First shutdown the PC and disconnect the RAID disks – just to ensure you don’t do anything to them by accident. Rule 1: take your time, double check things especially things like if it is “/dev/sda” or “/dev/sdb” etc. First create a USB book disk running Debian using the instructions Create a Debian Live USB fshutdowlash drive and boot from it. Login the Debian and follow the instructions Enabling SSH access to Debian live USB to enable ssh access to the host. Ensure you run ifconfig so you can work out the IP of the PC now it is running Debian live. From your personal PC run a putty session to the Debian live instance – using the IP you got above. Doing the rest from your personal PC will make life a lot easier, you can copy and paste instructions etc. etc. From the Putty use the instructions in Backing up Open Media Vault to backup the drive to remote storage. Now shutdown the PC, you can just turn it off, not need to shutdown gracefully. Swap out the old hard drive and put in the new one. 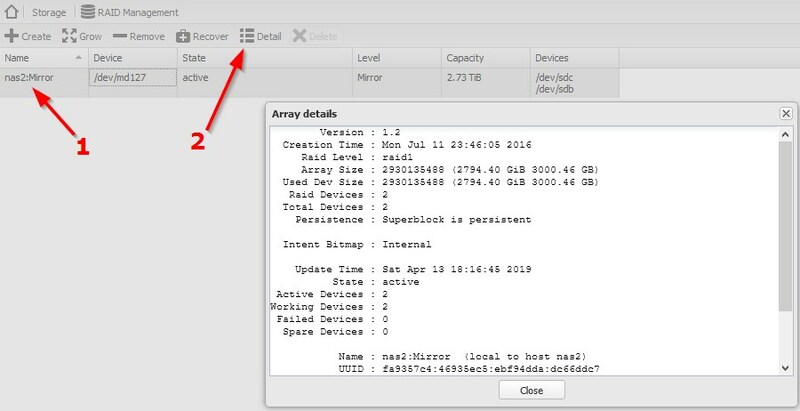 Ensure the RAID disks are disconnected just to be sure and again boot to the Debian live USB key. Once again follow the instructions to enable ssh, Enabling SSH access to Debian live USB. Again follow the instructions in Backing up Open Media Vault but this time follow the instructions in the section “Doing a restore”. Now unplug the USB and restart the server using the new system disk – but with RAID still disconnected. If that works again shutdown the OMV server and then connect the RAID drives. Finally restart with everything finished. 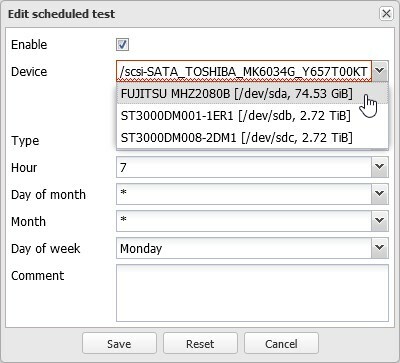 Select the new disk, FUJITSU in my case, and click on “Edit”. You will get a “Device Properties” dialog, select “Activate S.M.A.R.T. monitoring” and click on Save. At the top of OMV you will be prompted to “Apply” – click on “apply” and wait for the config to be applied. Select your new disk, in our case FUJITSU, and click on Save. Repeat this for the second scheduled test which is also marked as n/a – remember we have two scheduled tasks, a short one once a day and a long one once a week on Monday.